I squeeze the last bit of toothpaste out of the tube. I put water in the shampoo bottle to get that last little bit of shampoo. I put 150,000 + miles on my automobiles. And yes, I wear my shoes until the soles fall off. Just kidding on that last one but I do like to get decent life out of my shoes. I have a pair of running shoes that were still in decent shape except for the fact that the soles were separating from the uppers. I didn’t want to throw them away because I felt like I hadn’t gotten my money’s worth yet. So I decided to glue the soles. The first thing we need to do is to clean the area that is being glued. I used some isopropyl rubbing alcohol on a cloth. Let the area dry for a few minutes after cleaning. Clean the sole and upper with alcohol. 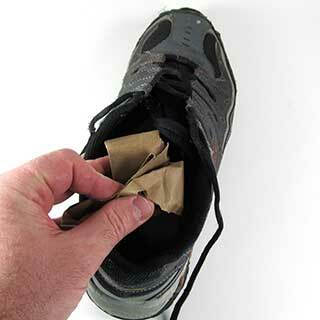 Remove the insoles if you can and stuff some paper in the shoes. 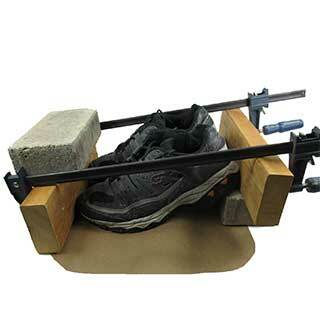 This gives the shoes some rigidity which is needed during the clamping process. It will also absorb any glue that may seep inside the shoes. I used some heavy kraft paper but you can use newspaper as well. The toe area should be firm after stuffing with the paper. Stuffing paper in the shoe. We will be using Shoe Goo to glue the shoes back together. Shoe Goo is a very thick and sticky glue. You will want to wear disposable gloves to keep it off your skin. Put some sort of paper or plastic sheet on your work table to catch any drips. Before opening the glue, read the instructions and the product warning label. 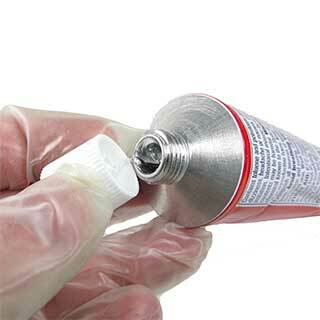 To open the glue, pierce the tube with the cap. I put some petroleum jelly around the threads of the tube to prevent the cap from getting stuck later. Pierce the Shoe Goo with the cap. 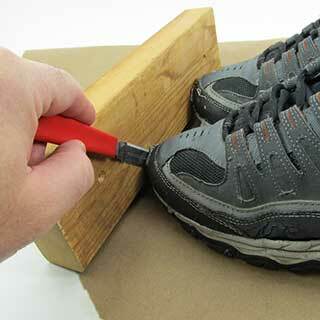 Use a toothpick to apply the Shoe Goo into small areas. For larger areas, you can just squeeze the glue directly where it needs to go. Then you can spread it around with a cotton swab. Don’t get the glue on the toe cap area (like I did in the photo.) We will glue the toe cap in the next step. The manufacturer’s instructions recommend acetone or citrus-based solvent to clean up the adhesive. I was afraid that acetone would melt the soles, so I used a citrus-based solvent for cleaning. I had a few different types of citrus degreaser. I found that my B’laster Citrus Based Degreaser worked the best. Use wax paper for small amounts. Spread the glue with a cotton swab. Let the glue cure for about 2 minutes before mating the surfaces. 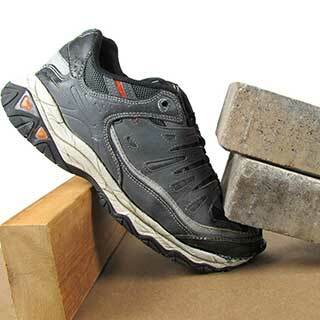 After 2 minutes you can places some weights on the shoes to hold the sole and the upper together. I used brick pavers as my weights. Put the heel of the sneaker on a block of wood as shown. This process will need to be done in two steps. We will glue to sole first and then do the toe cap area last. Let the glue dry for 24 hours. 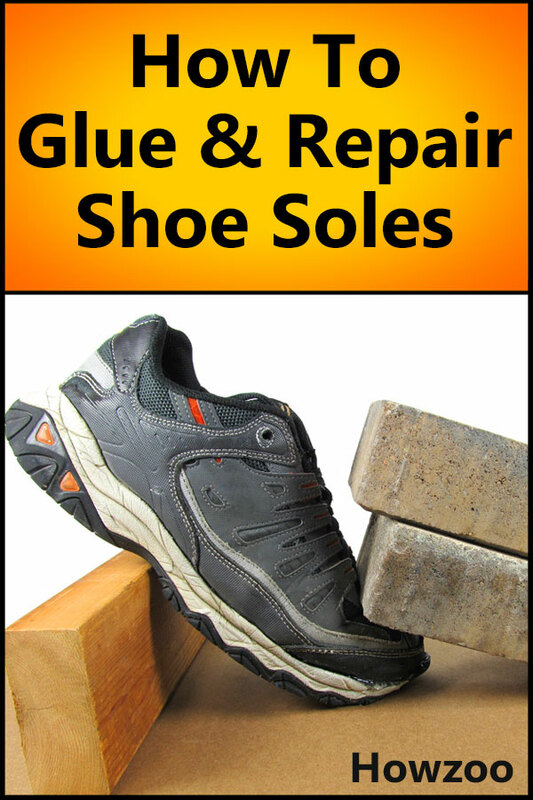 Bricks are used to hold the shoe together as the glue cures. After the sole has dried for 24 hours, we will glue the toe cap. Glue the toe cap to the front of the sneaker and clamp as shown in the accompanying photo. I used two 18 inch bar clamps, two blocks of wood, and two paver bricks. You may be able to figure out another way to do this but this worked for me. If I do this again, I will put some wax paper between the toe cap and the wood block to prevent the glue from sticking to the wood block. After 24 hours, remove the shoes from the clamping contraption. I didn’t use any wax paper and the shoes got stuck slightly to the wood block. I used a Scotty Peeler to separate the shoe from the wood. You will most likely have some glue squeeze-out that needs to be trimmed off. The best tool for removing this is a pair of Xuron Micro-Shears. I have been using Xuron cutters for many years and I feel that every workshop should have a pair of the Micro-Shears and also the Maxi-Shears. Separating the shoe with a Scotty Peeler. Trim the squeeze-out with Xuron Micro-Shears. 8. Sneaker Repair is Complete! Remove the paper from the shoes. These running shoes had a glued-in memory-foam insole which got a little out-of-shape from the paper shoved in the shoe. The next day they were fine. My old shoes live on! Now you can get a little extra life out of those expensive running shoes! Please share this article on Facebook and Pinterest. What model & make of shoe is that? Does the toe overlay cover your big toe? 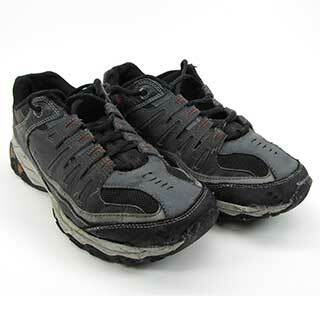 They are Skechers running shoes. I am not sure of the model number. The toe cap does not cover the big toe. Thanks for this step by step guide. I have a pair of classic white Reebok sandshoes in perfectly good condition but they need re-soling. I love them – they’re the original ones, c1983, with uppers made of soft garment leather. With your guide to hand, I’m going to buy a pair of cheap new Reeboks on gumtree, and swap the soles. Brilliant! Awesome. I have two pairs of Nike running shoes (1 street, 1 trail dating from 2005 and 2009) and they have had little use as the soles started separating in less than two years of use! My previous Nikes lasted 5+ years. In fact I switched to New Balance because of it. I had given up on them trying Gorilla glue and Superglue to no success. They still look new so I wasn’t about to throw them away during spring house cleaning and clothes donation time. Anyway I’ll be going by Wal Mart and picking up a tube of Shoe Goo and doing exactly what you did for both pair. I’ll report back on the success. Website now bookmarked for other hints as well! I used a shoe tree for the support, then I used a foodsaver vacuum bag on them to clamp it all together. Worked perfectly! Thanks for the great step by step and easy to understand method of repairing the sole of a pair of tennis shoes. I found it easy to understand and very helpful. Nice how-to guide. Shoe-goo is definitely a great product. However, I was interested in what to do if a sole has completely worn out/through, rather than a relatively unworn sole that has detached. By the way, shoe goo is also good for bulking up a shoe’s sole in external spot application, although it will be noticeable if you don’t have good colour matching. I believe skaters also use Shoe Goo to add ‘grippiness’ to their shoes.